Series hero Master Chief would have woken up from his cryo-sleep in the game, had it happened. 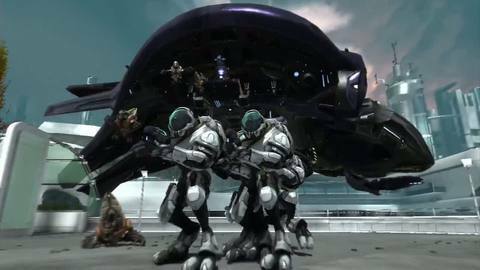 "Even before the idea to build a game based around Reach came about, a lot of other concepts were explored, up to and including a proper Halo 4, where Master Chief was going to wake up from cryo-sleep and we were going to tell that story," Jarrard told MTV Multiplayer. Although Reach, set to be the last Bungie-developed Halo, is shaping up to be one of 2010's biggest games, some fans are disappointed that Bungie decided to create a prequel to the first Halo rather than continuing Master Chief's story. "It just wasn't as interesting to the team to just pick up where that left off and all the baggage that came with it," Jarrard explained. "I think it was a little bit liberating. Hearing the guys talk about working through the trilogy and the obligation of keeping the themes moving forward and tying them up systematically. And ODST was also kinda nice 'cause they could do something different, something separate, and it's totally self-contained. "I definitely think that, for Reach, a lot of the same attitude carried over. We don't want to open up a whole bunch of doors that we're not going to close. By the end of this, it's all going to come to a nice, neat finish, and if people want to then go play the Halo trilogy, I think they'll have a better understanding of what's going on, but it's not required at all." There's been loads of speculation that Master Chief turns up at some point in Halo: Reach, but according to MTV Multiplayer, Jarrard confirmed that the faceless space marine "is nowhere in this game". Master Chief fans shouldn't be too worried, though. Reach is shaping up nicely. Game's out on the Xbox 360 on 14th September.